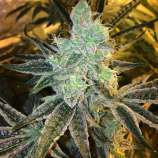 Here you can find a strain description about Paragon and also some user-based reviews and infos directly from the SeedFinder (if available). You can also find the offers and auctions here if Paragon cannabis seeds are on stock at MyCannapot right now. We strive to grow Gage aka the finest of natural cannabis. Pristine, living and expansive, our goal is to embody all the exceptional qualities of healing herb in our art and in our seed. An example of such beauty, the Paragon aka the Forum x Mendodawg brings forth illustrious wonders for all to enjoy. The Paragon brings forth incredibly tight and frosted flowers. The thick layer of frost creates spectrums of spearmint, fruit and cake batter filled with healing potency. Each flower has the potential to express in many ways. Some flowers stay tight and rock hard while others explode with foxtails. Expect hints of purple on these beautiful flowers. The effects are strong and uplift the mind while releasing the body of tension. The mind expansion sends us to new worlds. Buy Paragon now at MyCannapot!